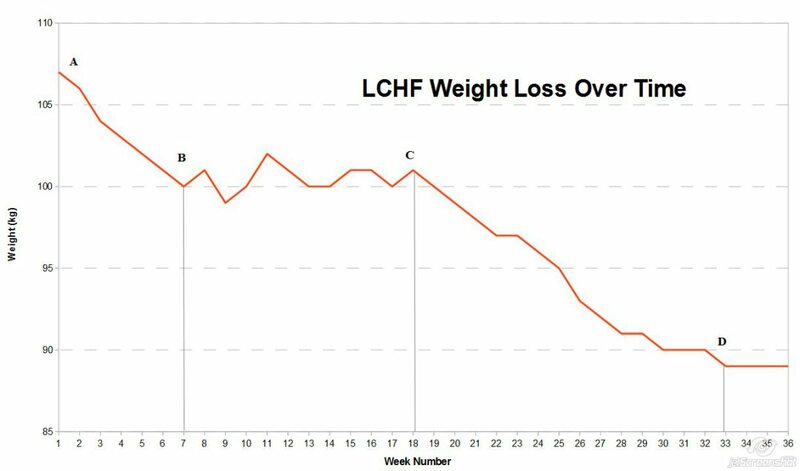 Nick lives in Finland and started doing LCHF in the fall of 2012, and after a few weeks of successful weight loss he hit a plateau (points B to C on the chart). He was still overweight but had stopped losing. After some experimentation he tried removing all dairy from his diet, and the weight loss resumed. Turned out that the dairy had knocked him out of ketosis. Some people do fine with dairy, so it’s worth exploring some changes if you are not getting the results you want. Nick went from 107kg (236 lbs) to 89kg (196 lbs) — a total of 40 lbs dropped. A-B: initial weight loss phase, strict LCHF including dairy products. B-C: “plateau” phase, as above. C-D: continued weight loss after dropping ALL DAIRY products with exception of clarified butter. Nick’s story can be seen at his blog, LIHF (Low Inflammation, High Fat) Living.